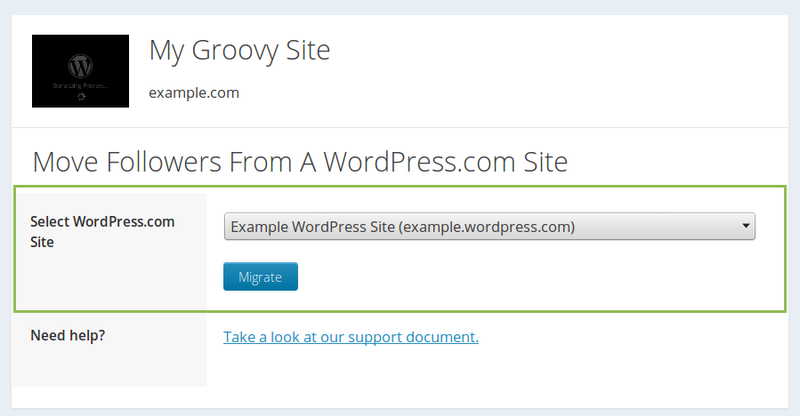 Now you can migrate your users who have subscribed to your WordPress.com site either by email or via the WordPress.com Reader to your Jetpack-connected self-hosted WordPress site. NOTE: Both the WordPress.com site that has the followers and the Jetpack site that will be receiving the followers must be using the same WordPress.com user account. In this document, we’ll walk you through the steps how to transfer your WordPress.com followers and email subscribers to your Jetpack-connected self-hosted WordPress site. How to transfer your followers. Log into your WordPress.com user account and go to your My Sites page. Next, click “Switch Site” on the Site Picker, and select your Jetpack-connected self-hosted site from your site list. In the “Move Followers From A WordPress.com Site” area, select your WordPress.com site that has the followers. Then, click the “Migrate” button as shown below. Click “Ok” to proceed with the transfer. You will see another notice at the top of the screen that your follower migration has been queued. You will receive an initial email to the email address associated with the WordPress.com account stating that the transfer has been started (#1 in below screenshot) and that the transfer has been completed (#2 below). Please note it may take up to a day for the follower counts in your stats in your Dashboard to accurately reflect the transfer. Keep in mind that while your email subscribers will continue to receive email notifications of new posts as before, WordPress.com followers will only see new posts in the Reader. They will not receive email updates unless they subscribe to receive those on your new site. You might want to post a notice on your old site about your upcoming move to keep your readers informed. Can I use this tool to move followers from one WordPress.com site to another WordPress.com site? No, this tool is only available for migrating WordPress.com site’s followers to a Jetpack-connected self-hosted WordPress site. If you need to migrate your followers from one WordPress.com site to another, please contact WordPress.com support. To migrate followers from Jetpack to WordPress.com or from one Jetpack site to another, please contact us with the URLs of the sites you’re moving from and to.